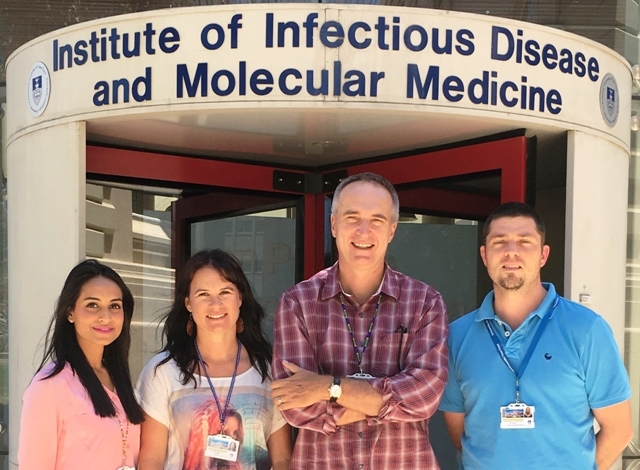 The Executive Committee is comprised of the Director, Professor Mark Hatherill; Deputy Director Immunology, Associate Professor Thomas Scriba; Chief Operations Officer Dr Masooda Kaskar and the Worcester Field Site Manager Mrs Marwou de Kock. Mark Hatherill is a specialist paediatrician, with accreditation in critical care, and an experienced clinical trialist who is active in the design and implementation of innovative trials of new TB vaccines through several consortia. He is a Full Member of the Institute of Infectious Disease & Molecular Medicine (IDM) at the University of Cape Town; a member of the SA Department of Health TB Think Tank, Working Group on Diagnostics, Drugs and Vaccines; and a member of the Global TB Vaccine Partnership, Working Group on Experimental Medicine. Dr Hatherill is funded by competitive grants from the Joint Global Health Trials scheme (UK MRC/Wellcome Trust/DfID) and US National Institutes of Health, and multiple Aeras contracts. Tom Scriba completed graduate training in T-cell immunology in HIV at Oxford University, in the United Kingdom in 2006. He joined SATVI, within the Institute of Infectious Disease and Molecular Medicine (IDM) in Cape Town as a post-doctoral fellow where he trained in paediatric and clinical immunology in tuberculosis and vaccinology. In June 2009, he took up a faculty position as a Senior Researcher, and in January 2014 was appointed Associate Professor at the University of Cape Town. He has also been SATVI Deputy Director, Immunology since 2011 and has been centrally involved in correlates of risk of TB studies in infants, following BCG vaccination, and in adolescents, following infection with M. tuberculosis. Masooda Kaskar joined SATVI in January 2016. She has held several senior leadership positions within the Pharmaceutical Industry. At Novartis she was instrumental in developing and implementing Transformational Growth Plans that resulted in establishing Novartis’s Leadership position within the industry. Her experience spans Strategy, Operations, Marketing as well as Managed Health Care. As Head of the Respiratory Division she was instrumental in driving improvements in the area of Cystic Fibrosis management as well as changing the landscape of Severe Asthma by launching the first anti-IgE therapy for the treatment of Severe Allergic Asthma in South Africa. Masooda holds an MBCHB degree from the University of Cape Town, as well as a MBA from UCT Graduate School of Business. Marwou de Kock graduated from the Cape Peninsula University of Technology with a Degree in Biomedical Science; she subsequently completed a Degree in Laboratory Management and is currently busy with her Masters Dissertation in Clinical Research Administration. She has been working at SATVI since 2002 and has an intricate knowledge of the site, the people and procedures in the laboratory, as well as clinical operations. She started in the SATVI Field Site laboratory and built it up to a world class facility that received SANAS Accreditation in 2010. She is currently responsible for managing the SATVI project office, overseeing and managing service delivery for all operations, as well as coordinating and implementing multiple research projects at the Field Site.